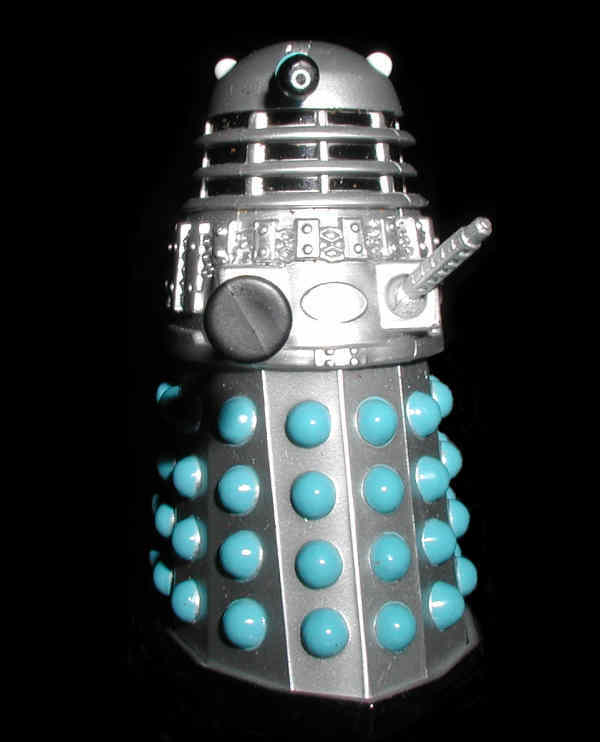 You can also listen to the Narrated Mr. Dalek at the Eurovision Song Contest as Ogg Vorbis (661 KB) or MP3 (715 KB). "Know your enemy," thought Mr Dalek as he settled in front of the television on Saturday night. "And now instead of our usual programmes we have the Eurovision Song Contest," said the announcer. "We'll see about that," thought Mr Dalek as he elevated and set off for Belgrade. Moments later he swooped down on the concert hall and zapped Terry Wogan. Next he zapped the judges with a cry of "Null points!" Hovering through the dressing rooms he zapped each act in turn before finishing off with the orchestra and dancers. Mr Dalek left the concert hall, pausing only to zap Terry Wogan again on the way out. "That's for having two Doctors on your telethon last year!" he shouted, and zapped him once more for luck. At zapper point Mr Dalek explained to the BBC technician that he wouldn't be getting anything more from Belgrade and that this would be an ideal opportunity to show 'Silence in the Library'. "While you're at it you might as well set up the next episode to follow. I hate waiting all week for a two-parter." Mr Dalek flew home as fast as he could and settled in front or the television again. A rather nervous announcer came on. "Because of the unusual events in Belgrade we are unable to bring you the Eurovision Song Contest tonight. Instead we have a treat for Doctor Who fans: a double episode featuring your favourite Time Lord in 'The Daleks of Manhattan'." Mr Dalek thought for a moment then zapped his television.